So you’ve downloaded the model, prepared a place on the shelf for the ready thing and… what’s next? Here you will find a couple of tips regarding printing and gluing the models from Repository, as well as the list of additional materials and explanation of symbols in models and assembly manuals. How to open the models and other documents from Repository? What does the symbols by parts numbers mean? 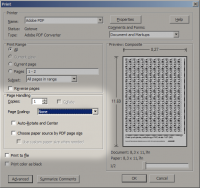 What is the perfect paper for model printout? How to print the models? What is the correct print setup for the model? How to glue and assemble the models? What additional materials will be needed? Do the models from Repository need painting? Are the models from Repository difficult to assemble? What are the rules and rights regarding the distribution of the models? 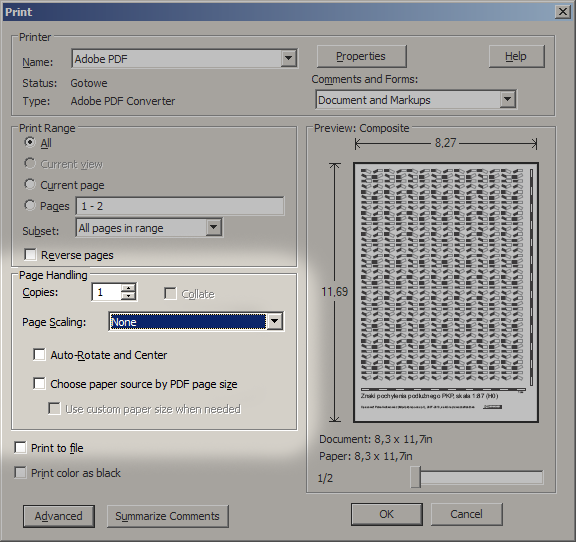 All models are available as PDF files, which can be opened using Adobe Reader. In all models available in Repository fixed symbols next to the part number are used to indicate the way to glue or form this part. three asterisks (np. 7***) – the part has to be glued on a cardboard to a total thickness of 1.1mm-1.2mm. Parts with Roman numerals (ex. XIV) have to be prepared from wire, plastic film or other material using the template in the assembly manual. A gray number indicates place where a part of this number has to be glued. If the place is too small to write in any number, a location of the part has to be determined from the assembly manual. Short sections on the extension of the edge indicates the edge along which the part has to be folded. Bend direction has to be determined from the manual. A symbol of scissors indicates an area that has to be cut out. If scissors lies on the extension of an edge, the part has to be cut through this edge. A cross inside a circle indicates the center of the circle ex. For positioning the cutting compass. If the part is filled in with color, a short sections around the part indicates its center. If a circle-shaped field is to be cut out, a cross lies in the middle of scissors symbol. any other shape of the symbol indicates the final shape of the part. Some parts are placed on a so called book. It has to be cut out as a whole, folded in half along the line with two halves glued together. After the glue is dry, the part can be cut out from the book leaving its both sides in color. If parts is required to have its thickness increased, the book has to be cut into halves and between them an additional piece of cardboard has to be glued. Parts forming one bigger component share the same number but are distinguished by the Latin letter next to the number (ex. 6, 6a, 6b). If there is only a slight difference between the parts of the same component, ex. in length, they are distinguished by an additional Roman numeral in superscript (ex. 1dI, 1dII, 1dIII etc.). If the localisation of the part is crucial, additional letters indicates its position ex. 1bLP (part 1b, left-front). In assembly manual, a complete component is referenced by the list of parts it is made of (except the parts made out from templates) ex. 8..8d indicates component consisting of parts 8, 8a, 8b, 8c and 8d; component 8..8c + 8e consists of parts 8, 8a, 8b, 8c and 8e. To find a paper or cardboard of a good thickness, one can take four sheets of a chosen paper and check if their total thickness is close to 1mm. Make sure the paper is not too spongy and does not have rough or visible grain. Models in smaller scales can be printed on a thinner paper. If you are going to print on a home printer, make sure it is capable of dealing with a thick paper. The best are the print-through printers, where paper enters from one side of the device and leaves on the opposite. In typical, consumer-grade printers, the paper is wrapped around a drum, so we risk that a thick and stiff paperboard can jam inside and even damage the printer. Under such conditions it is better to visit the nearest printing service. Models have to be printed on one side of the sheet, single page per sheet. Make sure the scaling of the page is turned off. To assure that everything is set correctly, make a separate print on a spare sheet of ordinary paper and check if the rulers along the edge of the page keep their dimensions (a single scale on the ruler is 1cm). A general rules of glueing the cardboard and paper models can be applied when assembling the models from Repository. A more detailed know-how is a very broad topic calling for a separate website. If you are just starting into the world of paper models, a good place to visit is Paper Modelers forum. the direction of rolling the parts that have to be formed into tubes, arches or shafts, is along the shorter edge of the page. The right tools to works with the paper model is the preference of the modeller. A basic workshop can consist of a good and sharp knive/cutter, a cutting mat and a 30cm ruler. And what with scissors? Well, after several years of paper models cutting and design I’ve learned that they are too cumbersome for a precise cut. More advanced modellers can consider extending their toolbox with a circle cutting compass. Another important tool is the glue. You have to experiment which glue suits you the best and gives you satisfying results. Remember that water-based glues can deform the paper and dissolve the print from ink printers. To glue the parts made from wire, any superglue will do the job. transparent plastic resins, packages etc. to create other transparent parts (like lampshades). The models from Repository are mostly available in two versions: color or black-and-white. Black and white model has to be completely painted after assembling. The color models may still require paining the exposed edges or the unprinted back of the parts. The models from Repository are of varying assembling difficulty. The most detailed models are in 1:25 scale. Despite their large size, they contain much more small parts (yet the parts smaller than 1mm are omitted). I would not recommend glueing a mechanical semaphore in this scale to a beginner. On the other hand the models of the table-top scales (TT and N) are very small and contain more parts which have to be made from the template. A good start might be the scale 0 (1:45), but still some experience in paper modelling is required.